While their boating technology did not allow native Americans of the eastern sectors of North and South America to reach Bermuda, the newly invented Bermuda Rig and accompanying Bermuda Sloop allow Bermudians in the later 1600s to reach into those regions, as well as into the Caribbean Sea and its archipelago of easterly islands, ranging from Trinidad in the south to the Bahamas in the north. Of particular interest were the islands at the southern end of the Bahamas land mass, known as the ‘salt islands’, later the Turks Islands, comprising Grand Turk and Salt Cay. Salt is an ingredient vital to human life and before the discovery of underground veins that could be mined, like coal, early Europeans in the Americas took a keen interest in where that mineral occurred naturally, through the evaporation of the water from the sea which left what today is known by the buzz phrase of ‘organic salt’. The Spanish, for example were taken with the island of La Tortuga, off the coast of Venezuela, and other places, where such surface deposits of salt were to be found and they expended much to defend such sources for their colonies and shipping. Bermudians were attracted to nearer islands, now part of the Turks and Caicos, like Bermuda yet an overseas territory of Great Britain. Once they took to the high seas on their own bottoms (boats), they used the salt they acquired for a circular trade between Bermuda, the Turks Islands and north to Nova Scotia and the British American colonies on the east coast of what became part of the United States, after the unpleasantness of 1775 and all that. The sloops took stone and cedar and people to the Turks Islands early in the year and took the salt north a few months later to trade for fish from the Canadian Maritimes and also into the East Coast in exchange for other essentials for Bermuda’s isolated-island existence. Thus some of the mineral for the great ‘salt cod’ industry in the north came from the Salt Islands via Bermudian merchants. Eventually, Bermudian families and individuals settled on Grand Turk and Salt Cay, so as to exploit the salt for more extended periods each year in the late 18th century and into the 19th. In terms of architectural style, many of the buildings in those islands exhibit characteristics of the unique vernacular architecture of homeland Bermuda. 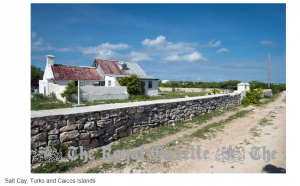 The largest expression of that transfer of building design is the “White House” on Salt Cay, likely built by Bermudian Daniel Harriott in the 1840s, perhaps consequent to his marriage to a member of the Dean family of the Turks Islands. The other buildings in the idiom, also of stone, are a number of Bermuda-style kitchens, with large chimneys, separated from the main houses which were largely of timber. A number of those buildings, now historic due to the passage of time and of their designs, have survived on Salt Cay and so it was a few weeks ago that a small team from the National Museum of Bermuda and Colonial Williamsburg were invited by Georgia and Bill Belk (she is a Harriott descendant) to visit Salt Cay and examine the White House and other buildings from an architectural history perspective. The scholars from Williamsburg were Edward Chappell (who has spent a goodly part of the last 25 years studying houses in Bermuda) and Jeffrey Klee. 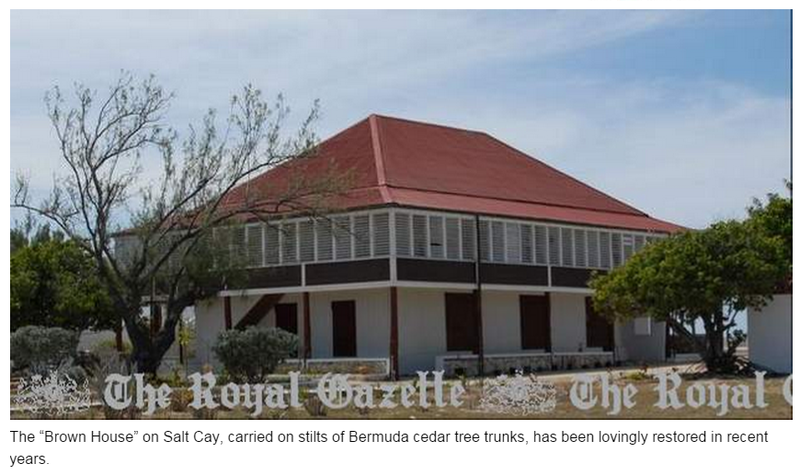 The team stayed at the “Brown House”, a structure of about 1825 supported on great pillars, which happen to be the untrimmed trunks of Bermuda Cedar trees, mostly in as good a condition as when installed. 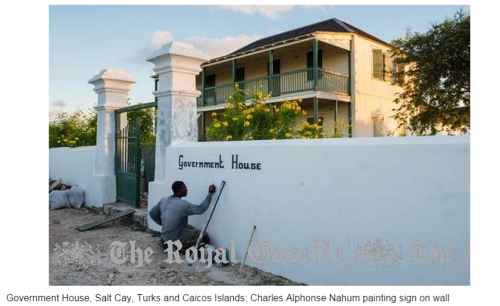 The Brown House has been restored in recent times by Helen Krieble, who has also been instrumental, with the TCI National Trust, in the saving and ongoing restoration of “Government House” in the southern district of Balfour Town on Salt Cay. Also connected with the Brown House and a major compiler of Salt Cay history and heritage is Candida Herwin, who was of great assistance to parts of the project. Many local and resident people on Salt Cay willingly helped the project, to whom our grateful thanks are extended. The examination and putting on record in measured drawings and architectural notes by the team included two churches, the White House, the Brown House, Government House and several smaller dwellings of workers or owners of smaller holdings of the salt ponds, or ‘salinas’, as they are there called. Such were the Christmas presents presented to the scholars in December 2014. 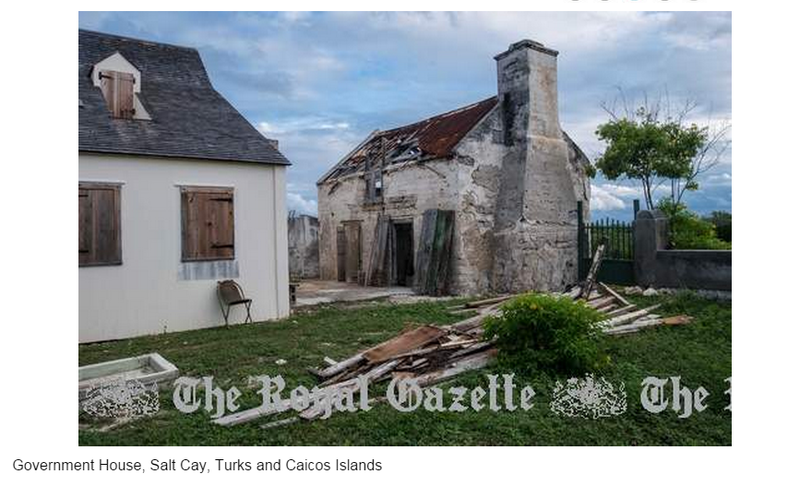 That project on Salt Cay raises the question of whether such recording might be extended to Grand Turk and South Caicos, so as to create a reasonable archive of the architectural history of the Turks Islands and South Caicos in the 1700s and 1800s. An eventual publication on the subject would be in time a Christmas present for those places, as well as Bermuda, given our long involvement with the salt trade and the settlement of those islands, where today Bermudian family names still abound.